Patola – Scientific name: Luffa acutangula Linn. 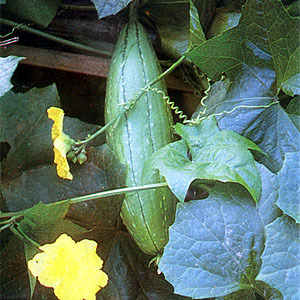 Loofah or Luffa, common name for a climbing plant of the cucumber family and for the vegetable sponge derived from the plant. There are six species of loofah plant, all of which are native to the Tropics and subtropics of Asia and Africa. The common name loofah and the scientific name Luffa are derived from the Arabic common name for this plant, lûfa. The most commonly used species, Luffa aegyptiaca, is an annual, monoecious vine (where male and female flowers appear on different parts of the plant), with deep yellow flowers. The female flowers are borne singly and the male flowers are in clusters. The leaves are hairless, lobed, and triangular in outline. Tendrils arise from the stems near the leaves and the numerous branches are long and slender. The cylindrical or club-shaped fruit can be up to 30-40 cm (12-16 in) long and hangs down from the stems owing to its weight. The skin of the fruit is ridged and green, becoming straw-coloured at maturity. The small, brown or black seeds are wrinkled on the surface and look like watermelon seeds. They are released when the lid-like apex of the fruit breaks off. It is the dried and bleached vascular system of the mature fruit that is used as a sponge or dishcloth in many parts of the world. The young fruits of Luffa aegyptiaca and Luffa acutangula are also eaten as vegetables in some countries. Scientific classification: Loofahs belong to the genus Luffa in the family Cucurbitaceae. • Decoction of leaves for amenorrhea. • Poultice of leaves for hemorrhoids. • Juice of fresh leaves for granular conjunctivitis in children. Also used to prevent the lids from adhering at night from excessive meibomian secretion. • Juice of leaves also used externally for sores and various animal bites. • Pulp of fruit used internally, like calocynth, to cause vomiting and purging. • Powdered dried fruit made into snuff for use by those afflicted with jaundice. • Seed oil used for dermatitis. • In Russia, roots is used as a purge. • In Iran and Iraq infused seeds used as purgative and emetic. • In India, roots is used for dropsy and as laxative; leaf and fruit juice used to treat jaundice. • In Java, leaf decoction used for uremia and amenorrhea. • In Bangladesh, pounded leaves used for hemorrhoids, splenitis, leprosy. Juice of leaves used for conjunctivitis in children. • In West Africa, leaf extract of ridged gourd applied to sores caused by guinea worms; leaf sap used as eyewash in conjunctivitis; fruits and seeds used in herbal preparations for treatment of venereal diseases. In Mauritius, seeds eaten to expel intestinal worms; leaf juice applied to eczema. • Seed used as insecticidal. This entry was posted in List of Medicinal Plants in the Philippines and tagged loofa, patola on March 25, 2009 by Pinoy Herbs. don’t you have a chemical composition on every part of the patola plant????????????? please have an information send in my email address…..